Here ya go! 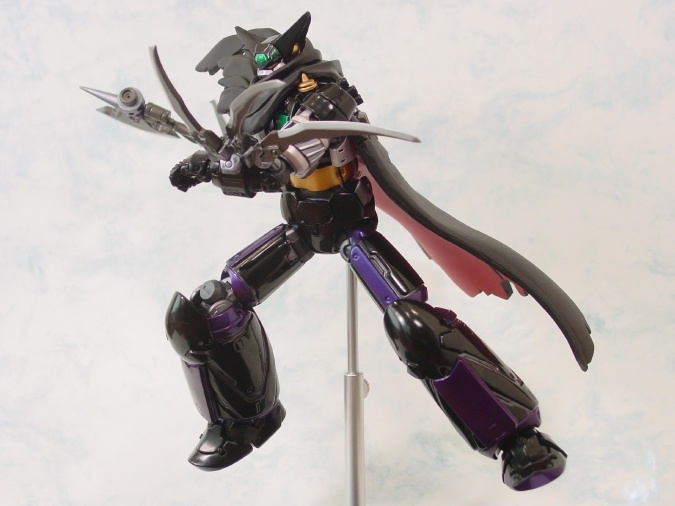 My impressions or review of the Fewture EX Gokin Black Getter Ryoma Mode.Let me start off by saying this is probably one of the most expensive figures I have. And it is worth every penny! 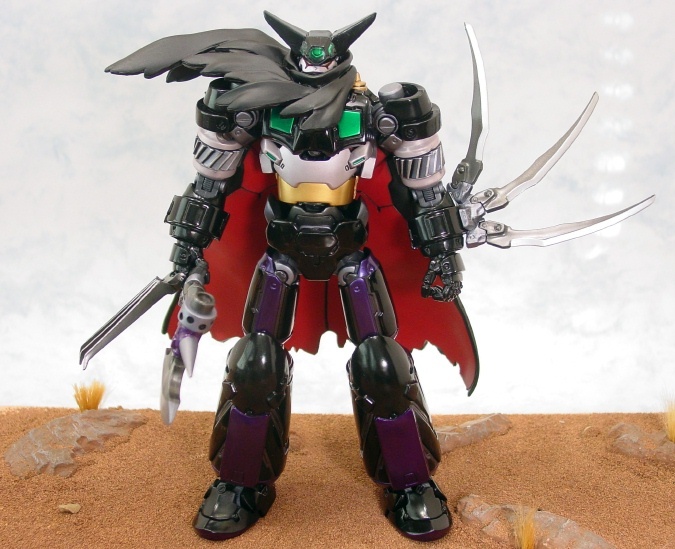 Black Getter is one of the coolest if not THE Coolest and best action figs I own dispite the VERY minor short comings. This particular robot was initially created by Gou Nagai (as you better know) and reimagined by Fewture Models of Japan and sculpter/designter Taku (Robo) Sato. Mr Sato also did the amazing Mazinger 1901 figures. 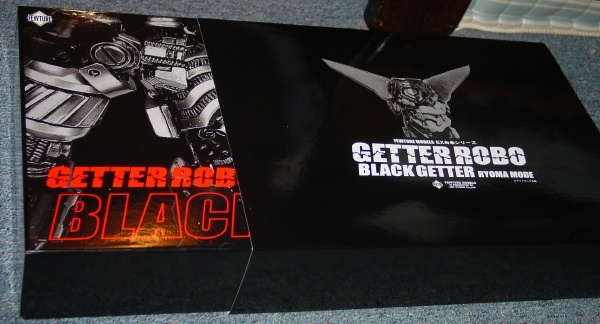 The EX Gokin Black Getter was to have been released by now last August, but was delayed due to production issues and ultimatly pushed into January 06 for shipment. It was made available exclusively through special mail order via Hobby Japan Magazine. May 10 2005 was the order deadline. Feels very sturdy and secure when you hold it. Also feels a bit heavy. 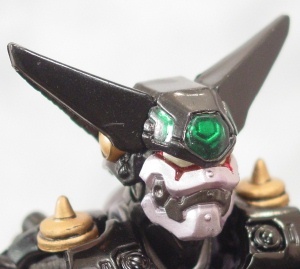 The box consists of an outer slip cover that features a symetrical cross section of the head of the Black Getter. 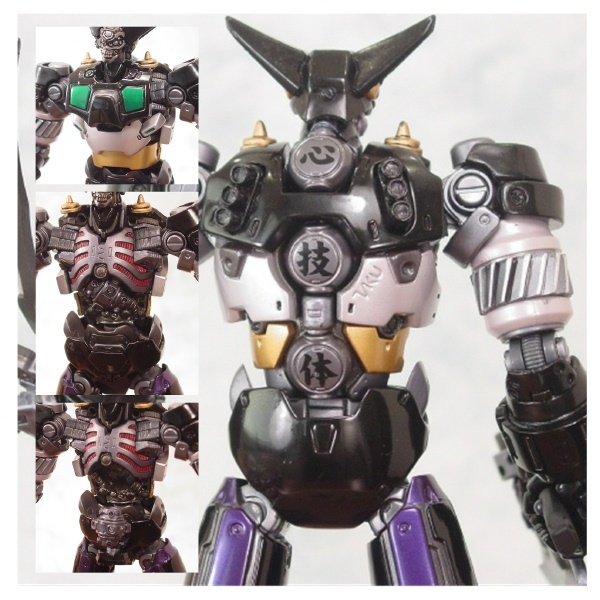 Removal of that cover reveals the internals of the chest/torso cavity of the Black Getter. The box is very glossy thick cardboard stock. I was glad to see Fewture use styrofoam to packagethe gokin and it's accessory.Oh yeah, it has a scent of brand new plastic/pvc/diecast that most new action figures have! Now, on to the figure and the contents! -Black Getter Lithograph by Taku Sato. Ironically enough, the litho has a faint scent of cigarette smoke...hmmm. I imagine a long night of Sato-kun signing thousands of lithos while chain-smoking. What a tough-guy! LOL! WOW!!! I couldn't help but go straight for the gokin! This thing is HEAVY. The legs alone must weigh almost 1lbs each!! AND it is SOLID!! Very sturdy to the touch! AWESOME! First thing I noticed was how heavy this thing is! If I had to take a guess at the weight, I'd guess 2 maybe 2 1/2 lbs in total. I don't have an official scale unfortunately.Next thing I did was move all the joints. The fingers of the right hand were very stiff. Required a little pressure.Most of the joints have a ratchet effect, making them, sturdy, able to hold a specific position. The joints actually make a CLICKING sound when you move them! I don't need to tell you that this sculpting is incredible. Taku-Sama has outdone himself!! But pictures will NOT do this figure any justice. You really need to hold this in your hands and see it in person to get a sense of how nice the toy is. The face, legs, arms and all accessories are crisply molded in their respective materials. The sculpting, however,doesn't really impead on the figures posability/articulation. I'm not an expert on this stuff, but this has to be the prettiest damn paint job I've seen on any of my own recent figures. When compared to the Mazinger 1901 figure, Mazinger's app is pretty good but the weathering and washes are sloppy and seem rushed whereas the Getter Robos primary paint apps are very neat and well placed. The colors are actually quite vibrant for being largely just black, silver, purple. Accents like the red(on the cape) the gold(on the abdomen) and the green on the chest and the head really make the piece pop! Usually something is left unpainted or over weathered on certain toys. But the paint style is very clean. Very glossy and fresh from the factory. The paint seems to adhere very well to the surface of the diecastand plastic sections. 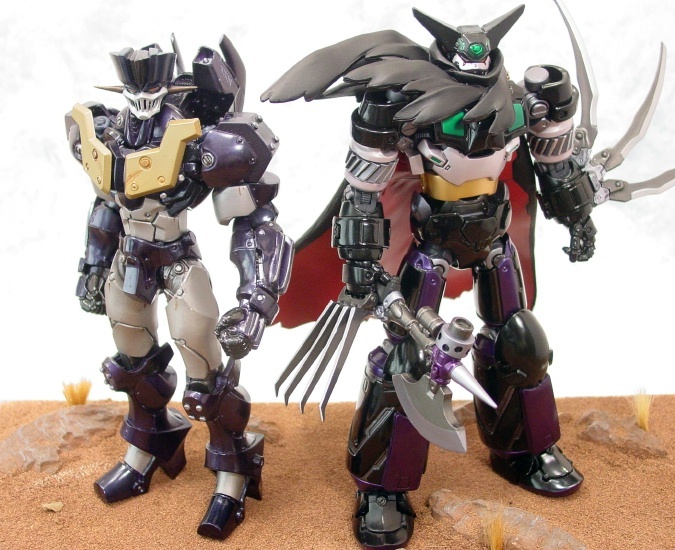 With the exception of the accessories like the axe, knuckle and forearm blades, Most of the blacks and gray color is molded in their respective colors and not painted. The joints are secure and seem to not suffer from the floppiness that plagued the Mazinger 1901 figure. The feet have a a ratchet joint at the middle of the foot which allows for positioning of the front portion of the foot.The ankle joints move from side to side, but they don't move forward or back. This lack of articulation obviously hinders the maximum articulation of the area. 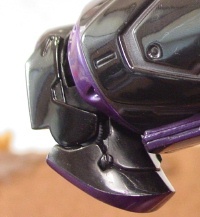 The front part of the foot is DIECAST metal. 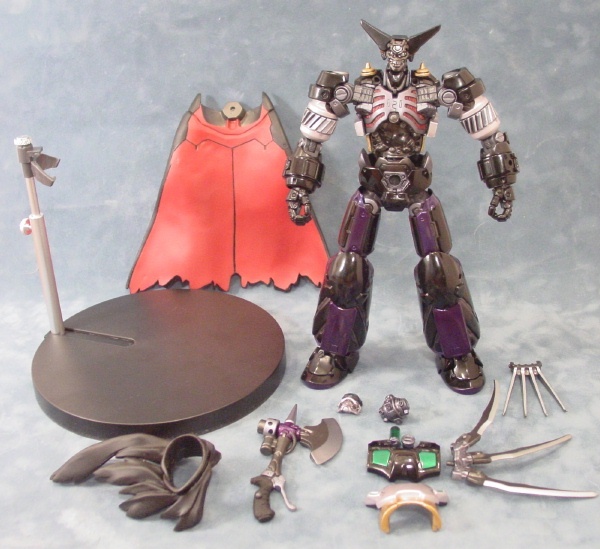 They are made from DIECAST metal with the joints being a ABS plastic material. The joints for the legs have a ratchet effect. 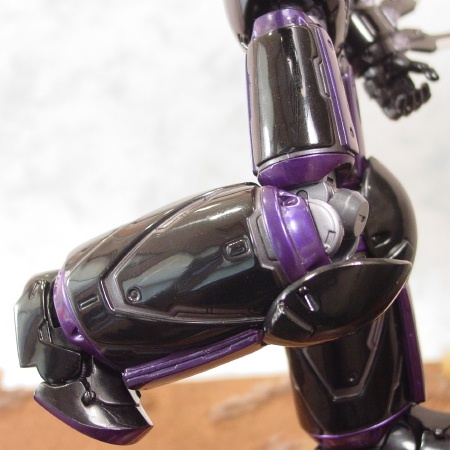 The knee covers and purple shin pieces are plastic. The upper thighs are also DIECAST with the groin ratchet joints being ABS again. 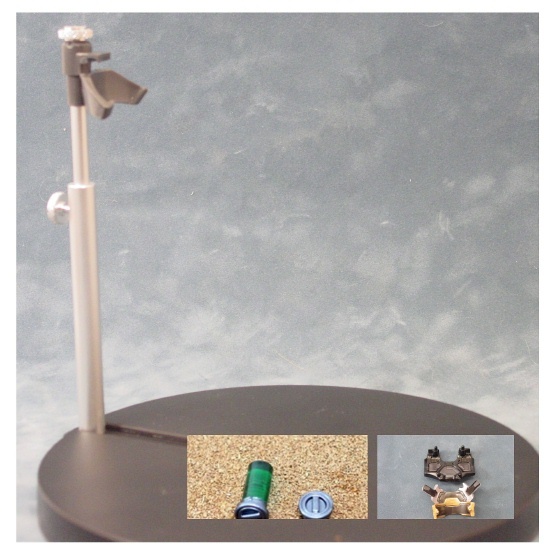 This part is made from diecast as well and features a small door that opens up to reveal the removable cap. The section is packaged with only the cap to the Green engergy tube installed. The actual tube is just a display pieceand will not fit all the way into the actual cavity. Connected to the midsection is a ABS ball joint that connects the torso section. This is where it gets tricky to describe, but I'll try. The actual base material of the torso is ABS plastic with diecast components.The stomach section has a cavity that allows for the connecting of the engine or heart section. You cover that section with a diecast metal plate. The chest area which is molded in ABS and sculpted like a ribcage also has it's own diecast metal cover!This was the main point of contention with Fewture models. They emphasize caution with this section while placing the chest piece over that section, as there is a potential for breakage. However, I found it to be quite sturdy as long as you're not using a hammer to bang on it. Laying the figure on a flat surface and applying a bit of pressure should fit the chest plate snuggly into place.The back has some diecast molded pieces on it as well. It has the male/peg sections where you will install the diecast metal discs thathave characters which say Mind, Body, Technique. When the cape is installed, there is a male/femail part that attatches itself to the center of the back and allows to show one of the dicast coil discs. The cape attatchment is one of my issues with this toy. The cape has some trouble staying attatched securely to the back and has a tendency to fall off if mishandled. Still it's a neat feature! The forarms are part diecast part ABSplastic. The bicep and shouldger area is ABS too with no diecast. 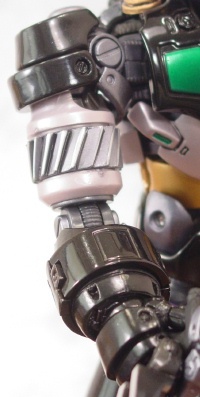 The elbow joints have that nice ratchet action which, again, makes for a nice firm positioning. 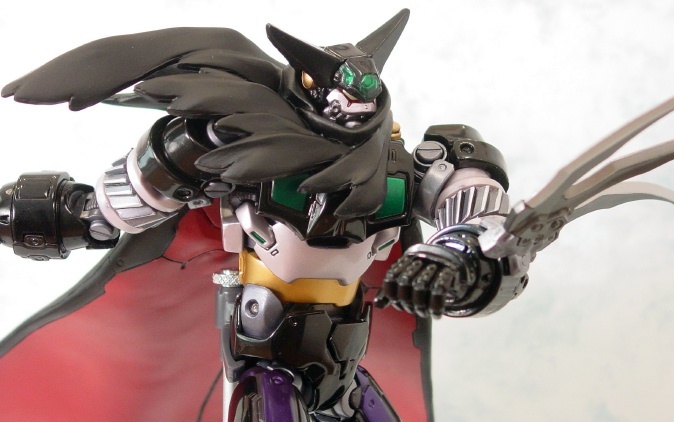 The shoulders are attatched at an angle on the upper torso region and have a forward articulation that allows the Getter Robo to appear hunched when the shoulders are posed forward. 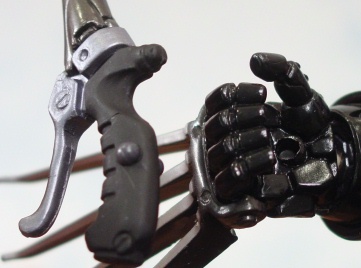 The hands seem to only rotate at the wrists, while fingers are molded together and attatched on a plastic hinge. The palm has a femail part for attatching the Getters axe. The entire head is plastic/PVC and has articulation at the neck and the base of the head. It's attatched via a ball joint and is all plastic. The face-plate is PVC.You can rotate the neck from side to side or make the head look up or down. You can also remove the head to attatch the muffler piece. Nicely sculpted, it has no real funtionality. However, it does stay securely in the figures hands. The Forearm blades are securely fitted as well as the ones for the knuckle! A large piece a tape secures the stand base and the pole accessory to the bottom of the styrofoam container. 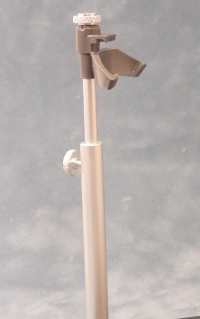 The base of the stand is plastic and the pole is metal with metal screws to make the hieght adjustable. So far as I find the base to be a very nice piece to include with this figure and very functional. I think it is surprisingly sturdy for a figure so heavy. 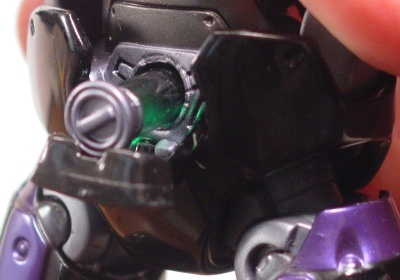 As I type this, Ryoma's Getter is suspended in air by the base.Again, this feels very secure because there is a plastic piece that connects to the back of the waist and firmly holds the figure in place. The plastic base part seems to be totally level without appearing to tip over. I'm just waiting for the cape to fall off! >_< The accessories inset are the insides of the abdomen and chest armor plates(diecast) and the plastic energy cylinder. I kinda dig retro 'bots. Specifically, I've always thought that Gou Nagai's Getter Robo had a bulky, bruiser-like quality about it that exudes giant metal robot goodness. However, I have to give many props to Taku Sato and his design skills. He has taken the whole design and breathed new life into it. Though it is metal it has an organic quality about it. 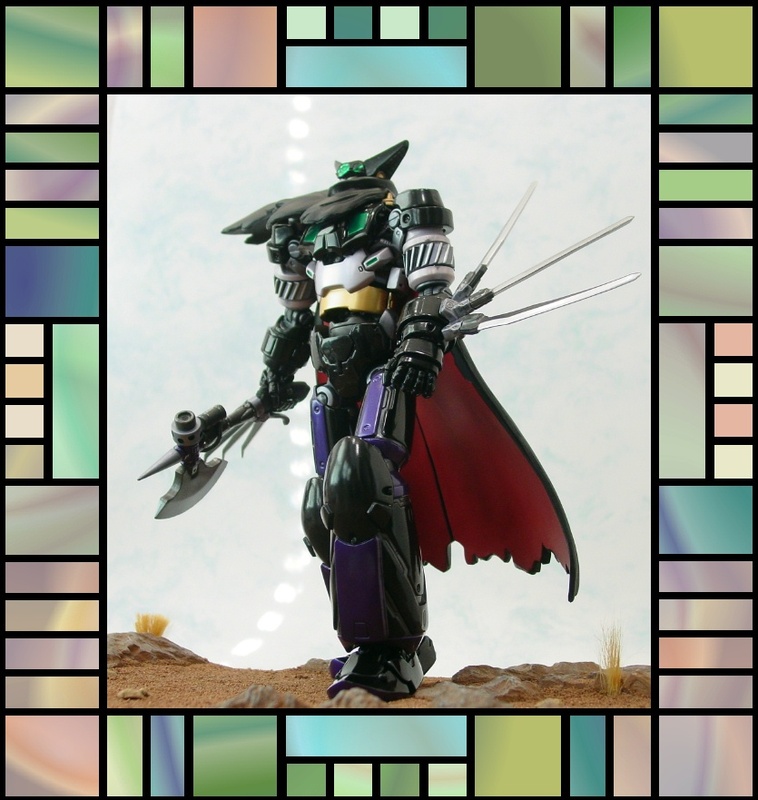 The sharp edges of the weapons seem to blend well with the contrasting roundness of the arms, legs and feet. 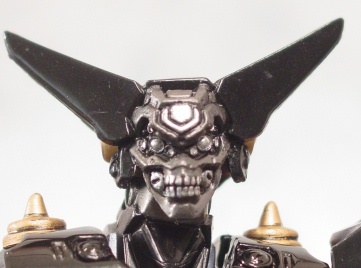 The new design still maintains Nagai's dark vision of an evil looking robot, but now it has a gothic quality right down to the skeletal like ribcage in the chest and the skull like visage when the faceplate on the head is removed. Very detailed-up! Thanks Taku! If you're a fan of Chogokin figures, you shouldn't really miss the chance to get it. 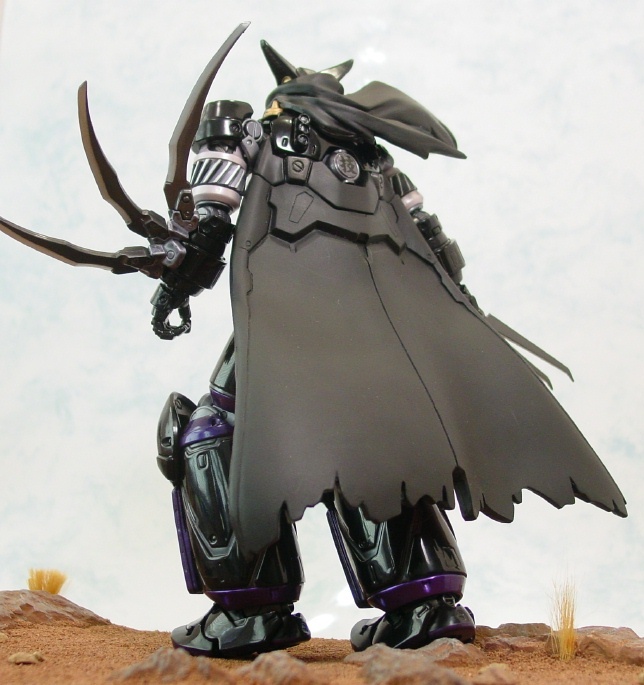 Even though it is quite expensive, about 30,000 plus Yen on secondary retail, the presentation of Fewtures Black Getter, via Hobby Japan is a nice solid piece of plastic and metal that is sure to keep your hands busy for a while!